It's no secret that I'm a fan of heels. They have to be entertaining though. What's great about Marty is he's instantly captivating. 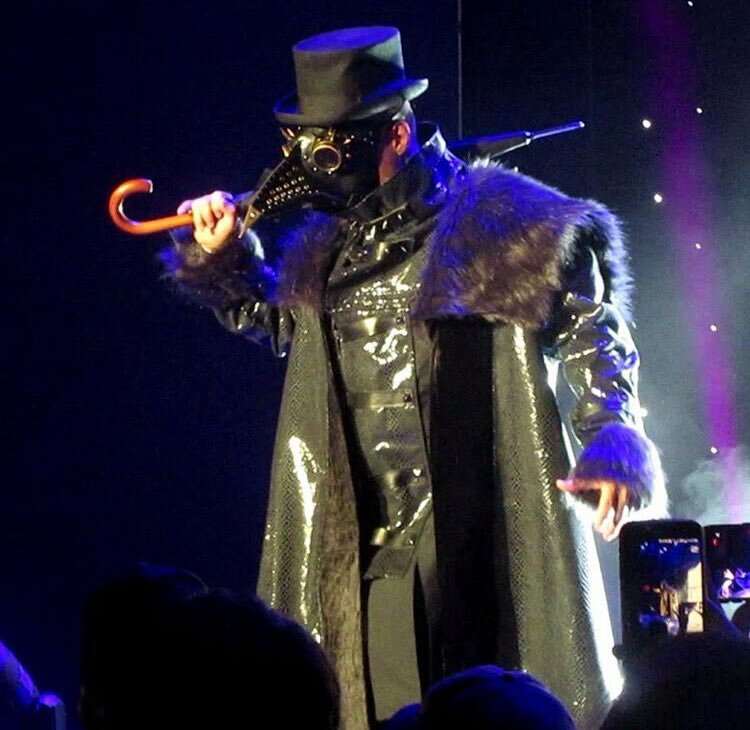 He walks down the ramp wearing a long, sometimes fur, coat, a bird mask, and brandishing an umbrella. It's an absurd looking getup outside of the character, but for Marty it works. It gets your attention from the get go. The Englishman from Littleport has a unique gift for taking the the most random elements and making them an endearing part of his character. As I've heard in multiple interviews, Marty has stated that he just incorporates the most outlandish elements he can think of, if they don't work he drops them. Most of the time they do and it makes for a spectacle to watch. It's not just his entrance attire that makes him entertaining to watch though. In the ring he takes full advantage of his "Villain" moniker. He pulls the underhanded tactics, taking every shortcut he can, and makes it fun to see what he does next. He's got a move, and I for the life of me don't know how he does it, where he's got his opponent on his knees. He grabs their fingers, shushing the fans as he once he does, and pulls them apart. There is an audible snap heard and I still don't know how he pulls it off without breaking their fingers. It's makes me cringe to watch it, but I can't wait to see it nonetheless. One of the most favorite matches I've seen of Marty's thus far is a six man match a few weeks ago. The premise was that there were six men in the match, but only two men in the ring at a time. Those men could tag out to another man, but only two in. It was like the WWE six pack challenge match, but I'm not sure if that's what RoH called it. Anyway, Marty's performance was brilliant. While the other five men busted their humps beating the heck out of each other, Marty only ever got in the match to break up a pinfall. He'd then promptly leave the ring or run whenever anyone came after him. Towards the end of the match, Marty made a blind tag (A tag seen by the ref, but not his opponents) and finally enter the match, and win it! All while doing very little in the ring. It may seem boring, and not a great showcase of Marty's wrestling ability, which believe me is considerable, but it's great. It showed Marty's ability to tell a story and live up to being the Villain he touts himself to be. Marty's charisma and meteoric rise has landed him in one of the most popular factions in wrestling right now, the Bullet Club. Marty deserves to be there among the elite group of wrestlers. He integrates with the group well, while still keeping a unique persona that keeps him standing out from the rest. Marty has also been able to take a move, that I've found pretty dull for the most part, and made me wait on the edge of my seat to see: The Chicken Wing. 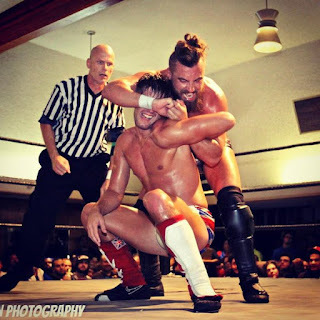 A submission hold that incorporates grabbing the opponents arm and pulling it around their back while simultaneously wrenching their head in the other direction, it's never been a move that captivates me. Marty has a way of building up to the move, that when he does his dance, has me yelling Chicken Wing! along with the crowd. Marty has admitted he chose it because it was the most boring finish he could think of. I guess that's how talented he is. He can take a move that he's admitted isn't very exciting and turn it into something fans can't wait to see. I'll admit I hold a special place for Marty in another area as well. Marty seems approachable. I follow him on Twitter and have had multiple likes and even a retweet from him. The retweet came from when I posted a picture Leslie had made for me of Marty in his bird mask and top hat. I thought it was great, so I posted it and tagged him. Much to my surprise, and Leslie's delight, he liked it and retweeted it. It was totally worth my phone blowing up to see the look on Leslie's face when I showed her. Marty is a wrestler I will watch for a long time to come and can't wait to see where he goes. If he continues to wrestle in Ring of Honor and New Japan, which won't be a bad thing, I'll be there. If he goes on and has even greater success in bigger promotions, I'll be there too. Marty's one of the most entertaining and charismatic wrestlers I've come across in my recent branching out in wrestling and I don't see him slowing down or losing it. I even searched my nearest Hot Topic for weeks hoping that one of his shirts would finally come in. I hope he sticks around for a long, long time. His start is on the rise and can only go higher. Marty Scurll is making his way to being one of the best. Long live the Villain! This is a Great piece Ken..you really painted a great picture of this guy.